Visitor Center at 106 W. Main St.
Yancey County, home of Mt. Mitchell, Highest Point in the Eastern United States. 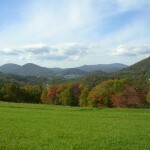 Yancey County is nestled in the diverse forests and lofty mountains of western North Carolina. The county shares its northwestern Appalachian Mountain Ridge with Tennessee. The scenic Blue Ridge Parkway outlines Yancey’s southeastern boundary. Burnsville’s historic Town Square is the site of the annual Mt. Mitchell Crafts Fair, the first weekend in August. Spectacular views enhance outdoor activities including golfing, hiking, skiing, horseback riding, canoeing, camping and fishing.